Yesterday I went to eAssessment Scotland at the invitation of Kenji Lamb, @kenjilamb. Kenji appeared on Radio Edutalk, Radio #EDUtalk 18-4-12: Kenji Lamb on Open Source Technologies – EDUtalk, and kindly asked David and myself if we would like to do some recording at the conference. I am taking a wee break from organising show notes for the posts to jot some notes down. Ian Guest In the pICTure and Colin Maxwell have already posted about the conference E-Assessment Scotland 2012 in more depth and detail than these random notes. Most of the attendees were from Higher Ed rather than school, but my main takeaway from the conference was that there are remarkable similarities between the different sectors of education and many similar explorations going on. David Boud kicked off with the first keynote talking about feedback which became, for me, the lens that I looked at the rest of the day through. Giving learners ownership, worthwhile feedback and the difficulty in doing so appeared in many narrative and conversations during the day. I was surprised that the phrase formative assessment did not come up frequently as it seem to me it was part of what every one was talking about. I was expecting a lot more about automatic computer generated assessment and was delighted not to find any. I was sort of expecting to be trying to grab folk in corners and record short boos with them, in fact Kenji had really sorted us out. We had a room with several ethernet points and more importantly Lynn Boyle, @boyledsweetie, had the role of childcatcher (or Roundup Girl) organising presenters, keynote speakers and others to come to our booth. I started out feeling a wee bit out of my depth in such higher ed surroundings. I was soon very happy as it became obvious that all our interviewees were gracious and generous. I’ve started to post the series over at EDUtalk tagged ‘eAS12’. This will take a couple of days as I’ve decided to make a bit more effort than usual with the shownotes. I’ve spent a fair portion of yesterday hunting down links and trying to avoid reading too much on the blogs I am finding. My gReader account has bulged again.. I was surprised how often educational blogging came up. Lots of interesting projects, open and closed are happening in higher Education, this parallels (again) schools. One of the seminars was directly about schools, Alex Duff of education scotland on Enabling Pupils to Record and Reflect on their Educational Experiences using WordPress. I am very familiar with the glow blogs as eportfolio system, having spent a fair amount of time training teachers in setting them up and working with classes to do the same. It was still well worth listening to Alex, it made me again appreciate all of the work done to make the blogs server the purpose of Building the Curriculum 5 and local authorities, creating a profile from a profiling blog. This is done with some wordpress cleverness. Considering the Glow install of wordpress is hampered by being an old version and the lack of opportunity to add plugins makes this even more impressive. Later in the day Alex was presented by a well deserved eAssessment award. I was interested to hear how Alex had evaluated various portfolio solutions before plumping for the blog and that Education Scotland are open to improving these as glow changes. Russell Stannard’s website teaching videos is one I’ll pass on to the teachers I work with. His method of providing feedback to students via screencasts of himself talking over the students work was really interesting. Chrissi Nerantzi‘s blog as does Cristina Costa’s skimming through the last few posts gets some mooc stuff and Why Facebook and teaching don’t go together. JISC CETIS MASHe Martin Hawksey’s blog looks like it is full of scripty goodness that is just over my head at the moment but some of his interests (aggregation) match mine. 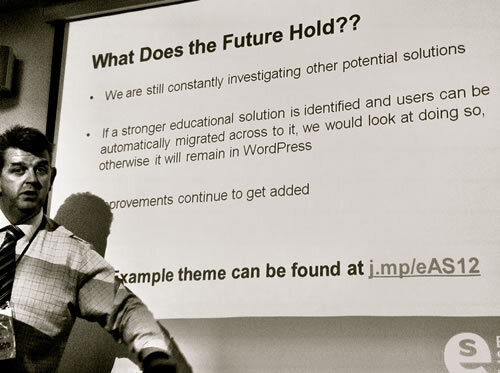 Sheila’s work blog » #moocmooc posts should help get upt to speed with moocs. Although I’ve hung about ds106 a fair bit over that last year or so some background reading will help. There are a lot more links in the EDUtalk – Filed under ‘eas12’ posts and I’ve collected them all together: eassessment scotland 2012 · linkli.st. At the time of typing this I’ve not uploaded all the audio or posted all the links. I hope to finish later today. It looked like it was going to be one of those bump into folk day when I met Derek Robertson between the station and university. Derek was introducing the second keynote of the day and took us out of Highrer Ed into the infant room with a tale of 5 year olds creating instructionla videos with very little support! As I walked into the conference I immediately saw Malcolm Wilson the first of many online pals. Malcolm is ICT Curriculum Development Officer for Falkirk Council Education Services and produces one of the most valuable blogs for using ICT in the classroom: ICT for Teaching & Learning in Falkirk Primary Schools which is useful well outside Falkirk. His recent post on Microsoft Office 365 for Education looks like saving glow users a fair bit of spadework. I met for the first time Ian Guest (IaninSheffield) on Twitter. Ian has been an EDUtalk stalwart tagging his boos for his 366 Web 2.0 – A Web 2.0 tool-a-day for 2012 project with edutalk. Alex Duff, whose seminar I attended was another grab a few words meeting. All three of these folk I would have liked to spend more time with as I have a pile of conversations and questions for them all. I’ll be recommending that to teachers interested in ICT if it comes up again. Finally David and myself grabbed a bite to eat with Doug Belshaw, Doug now works with the Mozilla Foundation where he heads-up their work on web literacies. There are probably not enough hours in the day for me to badge him about Hackasaurus, Open Badges and the like. I was disappointed not to see Doug’s seminar on Are Open Badges the Future for Accrediting Skills? I caught the last couple of Q&As which only made me more curious.